It is hard enough to keep up with learning during the school year, much less make it any fun for your child or teen. Of course, the younger the child, the easier it is to make learning enjoyable. Once they get to a certain age, most children don’t view education as fun, but as a chore and something that is sometimes hard to do. 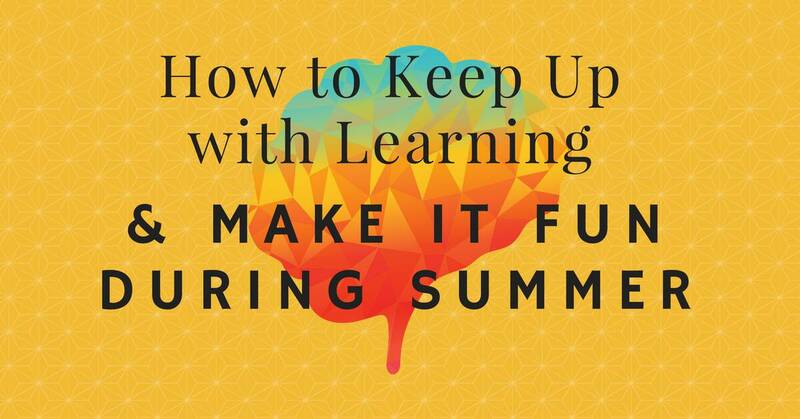 So how can you keep up with learning and make it fun during the summer? For the younger set, it’s easier to make learning fun. You have all kinds of opportunities to do so. Here are some great tips! Your child has been cooped up all year inside the classroom with lots of rules and “don’ts.” Why not make summertime a season for a little abandon and freedom? Let your child get messy; let him or her have fun by pulling out a box of craft materials. You can associate learning mathematics with arts and crafts. How many beads does it take to make this necklace? What shapes are we using? Take out the glue and even the feathers, glitter, and rhinestones. Talk about shapes and counting. Let the kids make summer-themed crafts or greeting cards to keep up with simple spelling and even poetry. What better way to make learning fun than to go on an adventure? Try to find seashells that have similarities and differences. Go on a hike to see if you can spot pine cones left over from winter. Look for a bird’s nest and examine how it is crafted. Dig for treasure at the beach and see what you can uncover. Once you have gone on a hiking or walking adventure, take time to go to the library and pick up some books about nature. Talk about the different shapes and types of leaves, the poison ivy to watch out for, and the pine cones and the seashells, too. Take some time to visit an arboretum and have your child learn about the different types of plants, trees, and shrubs grown there. Plant a small garden with your child and teach him or her the names of different kinds of flowers. Get a book on how bees help to keep the ecosystem running smoothly and what their real purpose is (not just to sting us!). A little bit of old-fashioned fun goes a long way in the summertime. How about some sidewalk chalk? Do some simple but colorful math equations right there in the driveway. Draw pictures of different nature scenes or practice your hopscotch skills.